GREAT NEWS FOR READERS OF TAKE AIM. WE ARE NOW CHEAPER!! Our price is now £4.50 – UK / €5.50 – Rest of Europe. TAKE AIM WILL BE RELEASED LATER THIS WEEK AT ALL USUAL LOCATIONS. WE HAVE REALLY EXCITING CONTENT IN ISSUE 11! A full review on the highly anticipated G2010 from G&G Armament! A full review on the upcoming ARES PPSH-41! Also reviews on top AEG’s from Classic Army and King Arms. Two full colour and in-depth Airsoft Pistol Reviews and our usual Tech section on a popular AEG. A full review on Sierra 2, Brit-tac, in Sheffield, England! A full review on SS Airsoft’s Battlezone! Exclusive coverage on this series of milsim events that will take place in numerous countries. 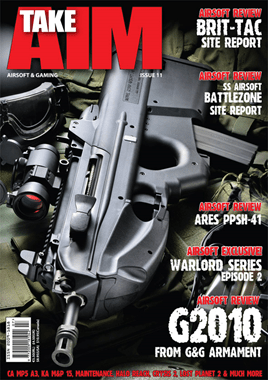 And we’ve also got our usual mix of airsoft content that features in every issue of Take Aim. And last but not least is our TAKE GAME section. Which features Crysis 2, Halo Reach, APB, Bulletstorm and Lost Planet 2.